In February, FHCA kicked off its first-ever Executive Nurse Leadership Academy, sponsored by Medline Industries and supported by RB Health Partners, Inc. Attendees from 15 counties met at the FHCA Education and Training Center in Tallahassee, ready to learn, share and make professional connections. Thirty-one selected nurse leaders came together for this three-day educational program, hearing from subject matter experts in human resource management, resident-centered care, trauma informed care, hospice, Florida statutes, risk management, reimbursement, quality indicators, skin health programs, and infection control and prevention. Kim Smoak, Field Operations Bureau Chief for the Florida Agency for Health Care Administration (AHCA), also provided a question and answer opportunity for attendees, sharing insights on AHCA’s surveyor process. The training yielded other professional and personal benefits. It became clear for some the connection made with their professional peers reinforced their confidence in their ability to lead. One attendee commented they had made “new friends for life” as a result of being a participant. “It felt fantastic to leave with the assurance that others are working to improve long-term care and they possess the same passion to move health care in the right direction,” said another ENLA attendee. One highlight from the event was the collective decision by the participants to contribute to the FHCA Education and Training Center funding by donating $1,000 as a group. 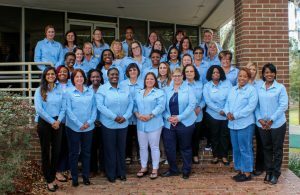 The inaugural Executive Nurse Leadership Academy class will be recognized with a commemorative plaque as an acknowledgment of their comaraderie and commitment to long term care in Florida. The kickoff event was just the beginning. During the 15-week program, attendees must complete four instructional webinars, participate in three FHCA Senior Clinicians Council conference calls and provide a brief team building activity to their staff, reporting the participation and outcomes to their center administrator. The Academy will conclude with a graduation ceremony held during FHCA’s Nurse Leadership Program on May 29 in St. Pete Beach. Applications for the 2020 Executive Nurse Leadership Academy will be accepted beginning June 1, 2019, and will be available via FHCA’s ENLA web page.